I’m a flexitarian, which means that I eat small amounts of healthy meat. As a yoga teacher, people tend to assume that I’m a vegetarian. I enjoy vegetarian cuisine and have experimented with vegetarianism, but it isn’t in my best interest to eat that way. I could replace meat with supplements or food combining options (such as rice and beans) and would do so if I had no other options. I just know that my energy level and health is enhanced from animal proteins. I understand that every person’s body is unique and their diet should reflect that. This is just what works for me. I grew up in an American home. My family belonged to a co-op for a while and supported the Maine organic farmers association. I experimented with vegetarianism when I was in high school, but quite honestly I had no idea what I was doing. When I went to college I didn’t like the cafeteria food, so I wound up eating a lot of cereal, bagels and salads. My boyfriend came to visit and saw how depleted I was, so we bought a hotplate and we made pasta and sausage in my dorm room. That first home-cooked meal was like finding water in the desert. After a year at college I decided to take a leave of absence and began apprenticing with my dance teacher. Being on the road and eating out a lot while teaching five days a week took a major toll on my body. During spring break I experimented with the Blood Type Diet. After just a week of eating according to my Type O recommendations I felt healthier than I had in years. I was eating sprouted grain breads, vegetables, fruits and small portions of healthy meats and fish. The higher cost of eating this way kept me from continuing, so I fell back into my old patterns. After my dance teacher passed I became friends with a group of people who had a cooking tradition. Each week a different person would cook a shared meal. I was very nervous about cooking for a large group, and my first attempt was a failure. One of the older women shared some of her cookbooks with me. One was specifically for “starving artists” like myself. I started teaching myself how to cook. I began to integrate these books with what I’d been learning about food energetics. Cooking became a meditation for me as I practiced listening to my intuition while preparing simple meals. I moved to New York where I met a Chinese doctor and martial artist. He taught me about cooking alchemy from an Oriental medicine perspective. I started to view my food as medicine. For the first time in my adult life I started relaxing my belly while I ate. As a dancer I’d always held it in out of fear of eating too much. I was exercising a lot and learned that in order to train effectively I had to have enough of the right kinds of fuel in my body. I went on to study yoga and Ayurveda, and continued learning about food as medicine. Like any other food, meat has medicinal benefits. My yoga teacher (who eats fish and eggs) taught me about the importance of gratitude and the power of prayer when eating. There’s a common misperception in New Age circles that eating meat is somehow less “spiritual” than vegetarianism or veganism. 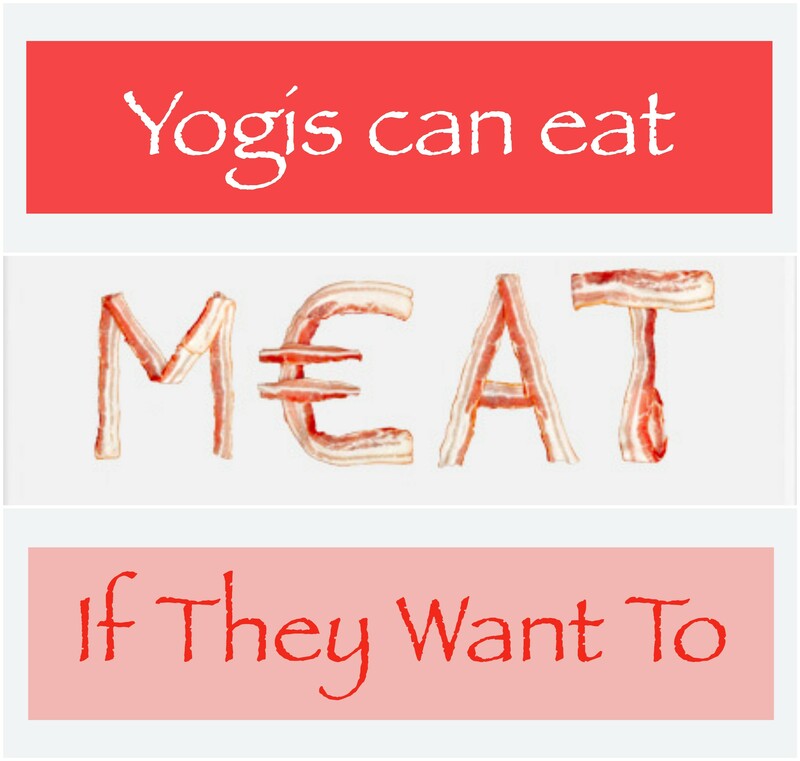 There are many yoga teachers who eat meat and even the Buddha ate meat. Apparently eating meat was what killed him though – the story goes that he died from being served contaminated pork, which is a great argument against mishandling. Every person has the right to eat however they want. This is just my story about food and I’m interested to hear yours. Feel free to leave a comment in the box below. Beautiful! I found this when googling “meat eating yogi cookbook”, and I was delighted to read your words – I could have written much of this! Do you have any cookbook recs or other resources? In trying to get more creative for my family now that I’m a mother, trying to step out of my regular box. I really love the aspect about honoring and experimenting with different cultures ways of making the meal a ceremony. Often, our meals involve a toddler throwing food, which we can honor in its own way (creative offering?)?!?! Thanks for commenting and I’m so glad you enjoyed reading this post. You may be interested to know that Tibetan yogis eat meat as a way of keeping their bodies warm in cold climates (unlike the yogis of southern India). I’d suggest that you try searching for Tibetan cookbooks or cuisine online and see what peaks your interest. Thank you Emily for such an introspective article on finding your food. Throughout my childhood in Maine having graduated in 1984 my mother kept going on strike as a Feminist so I decided that I was never going to depend upon anyone else to prepare my food. For the most part my mother was delighted to teach me to cook meals for her. We had a garden as well as my grandparents a few miles away so I learned how to cultivate my own food as well. And yes both cultivating and preparing food are a meditation for me. I seldom use recipes as anything more that a guideline being an alchemist at mind and hart. It did take me a while to feel good about cooking just for myself though. Doing the dishes…well that is something else still for now. I have been trained as a Chef in the Air Force and have have worked in restaurants from greasy spoon to 100% raw food vegan. For two years of my life I was mostly 100% raw food vegan eating just a few cooked grains in the winter and and it was great! Well that is until I scratched an itch and ate two much chocolate. I got soooo sick as just the shock of something so foreign alone was enough to trash my system. Then I decided to be more of a flexatarian from that point on. I call it the coyote theory in that I eat a little of everything just to be sure that I can. I did not know it then but the reason I was getting so sick was because I had chronic Lyme disease since 1974-ish. As the Lyme disease continued to deepen its grip on my ability to take care of myself I ended up homeless and eating mostly from out of date cans that I got from food banks for several years. As I started to get more disability form the VA I was able to eat better and my health immediately started and has continued to improve. I now have enough disability to afford the best food that I can for myself and eat a wide variety of foods from trash to treasure. My diet also varies winter to summer. One of my staples winter and summer though is nuts. Maybe that is why I am nuts? I love Bacon to and prefer to get it form the free-range farmers of Colorado whenever I can. Previous Previous post: Is Power Yoga the Anti-Yoga?